FARMINGTON HILLS, Mich. – (Jul. 24, 2018) – CCE, a leading provider of advanced CAD interoperability technology, has announced the latest update of its flagship CAD viewer and translator software, EnSuite. Most new enhancements and functionalities introduced as part of this release are aimed squarely at facilitating seamless data exchange across the Automotive Supply Chain. 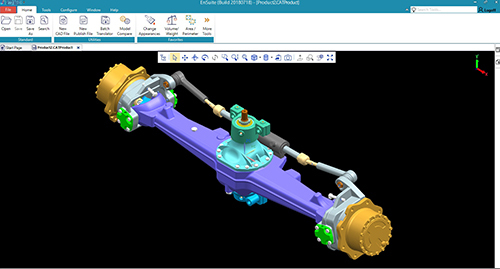 EnSuite’s latest update includes support for latest CAD versions including CATIA V5 R28, PTC Creo 5.0 and Autodesk Inventor 2019. This is in addition to support for other latest CAD formats like NX 12, SOLIDWORKS 2018, JT 10.2 and Parasolid 30 in updates earlier this year. “We are based in the Detroit area and naturally have a lot of customers in the Automotive industry. The need to constantly keep up with latest CAD updates is very critical as many Tier 1 & 2 suppliers as well as OEMs depend on our products to exchange data in their supply chain,” said Vinay Wagle, CCE’s Vice President of Sales and Marketing. The latest release of EnSuite 2018 also supports parallel processing in batch translation for quick transfer of bulk data. Users can also view thumbnail images for components displayed in the Bill Of Materials (BOM) list. This makes it very convenient to visually identify parts without having to open each part for viewing. Among other enhancements, EnSuite now allows viewing of compressed STEP files (.stpz). It also allows display/assigning of material to configurations. “Although most of these recent enhancements can be used by everyone, it will make life easy for most of our customers in the Automotive industry for sure, especially given the multi-CAD environment most companies in the supply chain operate in and the sheer volume of CAD data they deal with,” added Wagle.